Late last week, our community lost a sweet man and a great artist: Brian. It was a freak accident. He was walking his dogs. Someone else was walking her dog(s). One of Brian’s dogs bolted toward the someone-else’s dog, and Brian fell, sustained a head injury, and died. At least, that’s how I understand it. None of us can believe it. I have two tiny paintings by Brian. I love them. I couldn’t ever afford the big ones. Once a year, at an annual community art show, he’d offer paintings at much-lower-than-gallery prices, but the ladies from the rich towns would lie in wait for him and grab them all up. I just could not get into that scene. We’re all in shock, really. Saturday morning, I ran into Roy at the post office, had the Brian conversation with him—Roy, the artist of chicken icon fame. He told me he’d dealt with his mourning the day before through his own art. He’d begun to paint seven virgins for Brian—you know, the ones the good guys get in heaven. He said that while he was painting, he heard Brian say that he needed only one. So Roy stopped after the first. I stopped by Roy’s on Saturday to see the virgin. The sun was too low for a good photo. I drove by today to try to take another, but she’s disappeared, no doubt already in heaven with Brian. So here’s the sun-setting version of the virgin, offering cake. Godspeed, Brian. It’s that time of year again. It has been, for several weeks. The woolly bear caterpillars are crossing the roads. When I can, I swerve—slightly—to avoid crushing them with indifferent tires. I have crushed many. I’m sure of it. Woolly buggers!, I curse (this is anglerspeak). The Isabella Tiger Moth (Pyrrharctia isabella) can be found in many cold regions, including the Arctic. The banded Woolly Bear larva emerges from the egg in the fall and overwinters in its caterpillar form, when it literally freezes solid. First its heart stops beating, then its gut freezes, then its blood, followed by the rest of the body. It survives being frozen by producing a cryoprotectant in its tissues. In the spring it thaws out and emerges to pupate. Once it emerges from its pupa as a moth it has only days to find a mate. In most temperate climates, caterpillars become moths within months of hatching, but in the Arctic the summer period for vegetative growth—and hence feeding—is so short that the Woolly Bear must feed for several summers, freezing again each winter before finally pupating. Some are known to live through as many as 14 winters. A perk of my job as a journal editor is forming relationships with authors. Gordon, as recently noted, has been with me from the beginning, and clearly I hold him in the highest esteem. But there are others with whom I’ve developed friendships. I am fiercely loyal to and protective of my authors (in the midst of inevitable institutional politics). The editor/writer relationship can be a wrestling match of wills as I (with the help of my beloved copyeditor) take the manuscript (the author’s baby), dock its tail and crop its ears like a Doberman, then clean it up to present to the world. The process can be painful, but in the end, most authors are pleased with the result. One September day in 2009, I received a package from Bill, a Texas lawyer who has written a few of articles for me. I was expecting a package from someone else, some CDs or photos to go with an article, so I was momentarily confused when I opened the package. Recently I realized that we have been working together for more than 10 years. I have enjoyed the opportunity to be a part of [the organization] and being able to contribute to the journal. Please accept this fly-reel case as a token of our friendship (albeit long distance) and to acknowledge your good—no, excellent—work as editor of [the journal]. Mary Chakee (1935–____), Navajo Beadwork Artist, a member of the Tohajiilee band, Canoncito Navajo Reservation, New Mexico, USA. Ms. Chakee is known for her beadwork that adorns Navajo ceremonial costumes. She signs her work with two yellow beads on the perimeter. Beadwork was introduced to the Navajos through contact with other Indian tribes and Euro-Americans. Originally, beads were made from shell, turquoise, abalone, and jet. 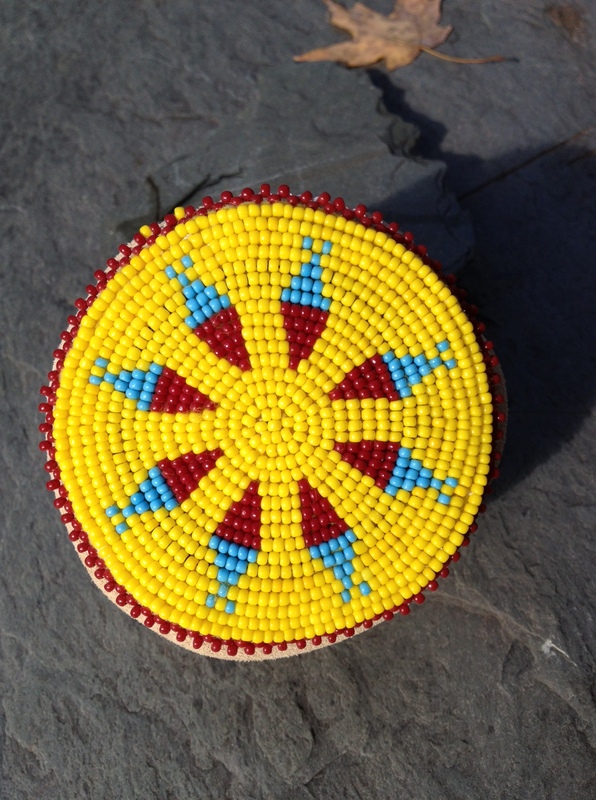 Beadwork represents the Navajo way of expressing religious, cultural, historical, and personal traditions and beliefs. As artists, Navajos are creative and use their beadwork on everything from sacred ceremonial costumes to knife sheaths, belts, and key chains. Religious designs will not be used for commercial purposes, such as key chains and items found in gift shops. Artists are influenced and draw heavily from the natural desert and sky colors of the American Southwest. The Navajo forefathers believe their minds, thoughts, and knowledge came from colors. The idea for a decorative fly-reel case came from reading about a gift from Native Americans to President Theodore Roosevelt. On his 1903 western trip to officially open Yellowstone National Park, he was presented with a beaded pouch. He later used the pouch to store his fly-fishing reel. The beadwork on this reel case is a traditional basket-weave style symbolizing the compass, with the colors of the sun and sky at sunset. Navajos believe that if you follow the sun, you will never be lost, and the points on the compass show the way. This case was especially commissioned in 2009 by GWF for Indigo Bunting. This is one of the most thoughtful gifts I’ve ever received. It sits on the mantel, close to Gordon’s tie. It never occurred to me that I would get to meet Bill someday. But he and Gordon, both members of the London club, met. Together they arranged the club’s first American event and plotted to get me to it. Did I ever tell you about Gordon? Perhaps the tiniest bit, here and here. And here and here. I call him my 87-year-old boyfriend. When I took on the job of editing a quarterly journal 18 years ago, I inherited him, a writer. I knew him only through letters (then e-mails) and the occasional phone calls. We took to one another immediately. He has been threatening to die since the very beginning, which was before he turned 70. If he ever decides to up and do it, I shall crawl into a hole for days or months or years. In 2005, he self-published a play, a conversation between two historic anglers, and dedicated the piece to me. He staged it once, one performance only, in Boulder. I offered to fly out to see it. We could meet in person. He thought about it. Decided it would make him too nervous. Told me not to come. So I sent a bouquet of autumn orchids, which made it to the stage, brightly and stubbornly sitting in for me. I figured we’d never meet in person. But then Gordon and another author of mine, both members of a prestigious London club, decided to hold a club event in Denver, the first ever in the United States. I was invited (a woman!). I knew the chance would never come again, so off Tim and I went to vacation in Colorado for a week, attend this black-tie affair, and at long last meet Gordon. Did you get that? Black tie. Tim would have to rent a tux. He would have to learn to tie a bow tie. I think we are totally screwed. I just tried with a perfectly reasonable online tutorial. I failed miserably. And we can’t bring this one along to practice. I am hoping one will arrive pre-tied, or we may be unable to attend the event until help arrives. I have a wonderful one pre-tied. It’s old, elegant, and a marvel of structural engineering. I have it here for you. Or I can and will tie it. Do NOT worry about it. I can valet with the best of them. I told him to bring along the pre-tied tie. And the next evening I met Gordon for the very first time, in the lobby of the Hotel Boulderado, where his grandmother had lived back in the day and where his grandfather had once had a barber shop. He’s a delight. The next evening we had that long-awaited martini we’d been threatening, mixed by Gordon himself at his home, with my husband and his wife and daughter there too, everyone enjoying the perfect drinks and magnificent company. Gordon handed me the bow tie early on, I think—maybe that first evening. But maybe it was the evening of the event itself, as he remembers it. No matter. The tie turned out to be one that clipped to the top button of the shirt—nothing around the neck at all. A marvel of structural engineering. He wanted Tim to wear the tie, and then he would give it to us. This tie, a tie, any tie, so tight around the neck, enough to confound anyone about everything. So, I must be brief. We flew off to Powell, Wyoming, in early September 1950, to teach school. A little town of some 3,500 souls in the Big Horn Basin. The town had been pre–laid out precisely by the government land offices in 1909 on perfectly ABSOLUTELY flat desert land, soon to be watered by irrigation into small 80-acre homesteaded farms. Water would not drain in its streets—not a great problem because there was so little of it. I emphasize the absolute flatness of the town because it meant that there was no proper hill for the owner of the town’s one bank to build his house on and so look down on all the rest of us. Bank president and owner Bob N—— had been the very first baby born in the brand-spanking-new flat town—in 1910. Bob was smart, conservative, and strategic. He also could sense irony and paradox, and was not without a certain charm. Somehow or other we got to know him and his rather glamorous wife, who was an excellent cook. They even had this nobody of a new schoolteacher and his wife to dinner. I should add that Bob was a fly fisherman and wanted to be serious about it. That in itself recommended me to him. He craved improvement. Betty and I were curiosities for him. How in the world could he like and be drawn to people so different in worldview from his? Democrats! He must have seen some of my early theatre work at the high school. Because one day he said to me, “Gordon, I don’t come to your plays anymore because they are all religious plays.” To this day, that estimate of my work remains the most valued of all. Bob caught on to what I was trying to do: be serious; that is, “religious” about everything. And he didn’t like it. He knew I was an apostate, and he believed in nothing, not even money. I liked him. I always felt warmly toward him. I told him to be damned careful before he cast off so good a cook. But, the tie, the tie, what of the tie? Bob’s uncle and aunt Chris and Monty F—— lived a door or two away from Bob and Evelyn and across the alley from us. (Bob had built a modernist home on the flat land and a shockingly late-modern new bank building that folks thought crazy.) Uncle Chris and Aunt Monty were genuinely cultured and cultivated people, of that particular American stripe who read their Emerson and their Shakespeare. And they died. That’s what they got for their pains: They got dead. And amid all that stuff was this clip-on black formal bow tie of such ingenious design. I admired it, mused on it, treasured it, and never wore it. And kept it to this day on September 13, 2012, at the Brown Palace Hotel in Denver, where for the first dinner of the London Flyfishers’ Club, Tim wore it. And so things come round. I think Uncle Chris would be gladdened that Tim used it on so auspicious an occasion. Banker Bob N——? When after 16 years we decided to leave Powell and go to Stanford for a Ph.D., I grew fainthearted at the thought of going off utterly penniless. So, I asked Bob, what if we get in a jam and need some money, might I come to you? “Gordon,” he said, “call me and I’ll have money to you the next morning.” We never had to call on that offer, but you can imagine the comfort in it. Like the F——s, Bob eventually got dead for his pains. And you have the formal black bow tie. Pass it on. 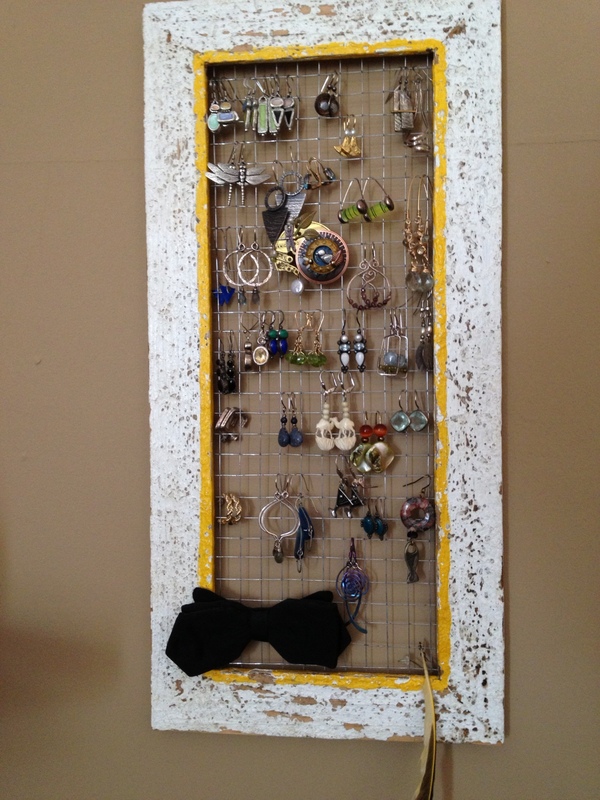 Here’s a photo of earrings (a rather disheveled display, I’m afraid) and the tie. Bird sightings are as infrequent as my posts. I promise, I will be back. Somehow. The weight of the world and tasking has just been too great, it seems. In September, in Pennsylvania, on the same day: at last, a for-sure Cooper’s hawk and, even more exciting, a yellow-billed cuckoo. When was the last time you saw a yellow-billed cuckoo?